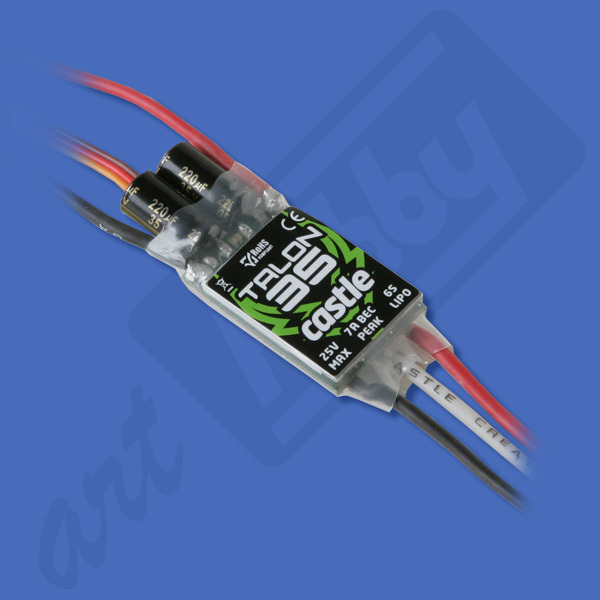 This is a Castle Creations-35, 35 Amp Brushless Aircraft/Helicopter ESC. 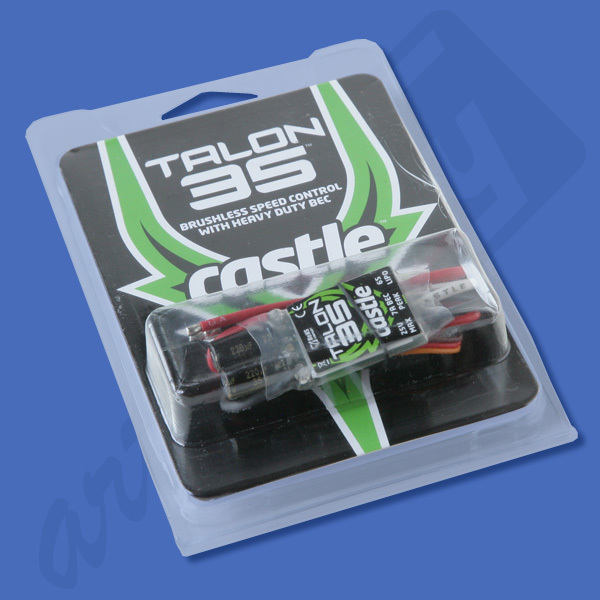 Castle Creations is proud to introduce the next ESC in the Talon series, the Talon 35. This "mighty mini" can take on the most extreme maneuvers while keeping it’s cool. Talon 35 is intended for use in 450 Heli setups running up to 6S or .10 to .20 fixed wing applications pulling up to 35 amps and boasts a 7 amp peak/5 amp continuous BEC, keeping even the most draining servos at ease. The Talon 35 also offers Castle’s industry-leading helicopter functions, not to mention easy programming using the Castle Link USB adapter (coupon included). The compact layout and thin profile make mounting the Talon 35 simple and stress-free in any setup. The Talon 35 offers Castle’s industry-leading functions, not to mention easy programming using the Castle Link USB adapter (coupon for free Castle Link included), or the Castle Field Link Portable Programmer (sold separately). 27.8 g / 0.98 oz. 12 g / 0.72 oz.